3. Solid wood drawers feature front dove-tail joinery and ball bearing glides. 5. Door features stylish iron mesh finished with a durable powder-paint in a “rust” color. 7. Mortise and tenon joinery construction on solid frames. 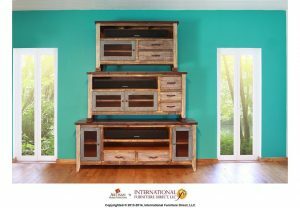 * 52” TV Stand perfect for reduced spaces * 62” TV Stand holds most medium sized TV’s * 76” TV Stand holds large sized TV’s. 2. Beautiful antique looking piece with smooth, quality finish. 3. Dove-tail joinery on drawer fronts provides durability. Ball bearing glides ensure a smooth glide. 8. Unique design and forged iron durability. * 52” The perfect small size * 62” Medium size * 76” Large size TV stand.